It seems that autumn is here, despite the warm weather of the last few days. The leaves are turning on the trees and hedgerows, most of the harvest is in (we’ve been gorging on blackberries for weeks!) and there’s a definite chill in the morning air. The summer seems to have flown by. But every season has its own special treats. Autumn, in our village, means cider. 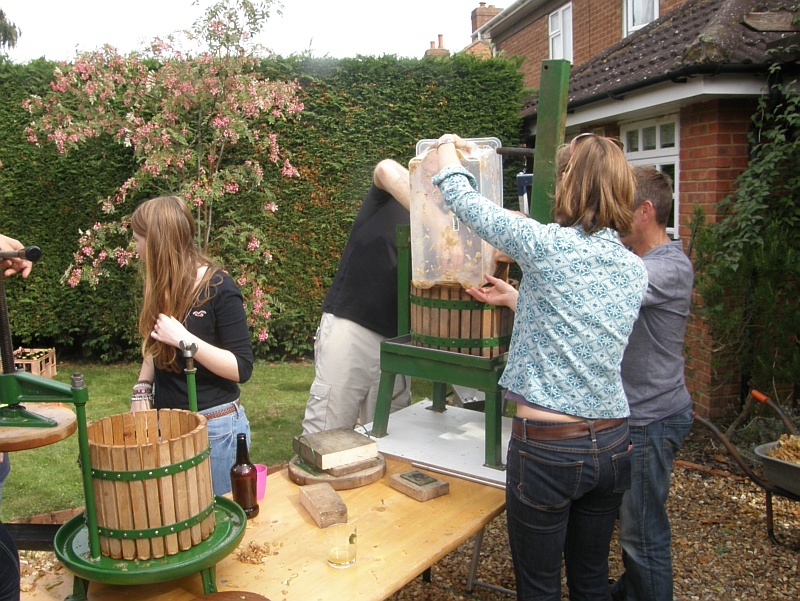 On Sunday the village cider collective convened for the third year of chopping, pulping and pressing and juicing. The idea of the collective is simple. Lots of people have apple trees. Very few eat all the fruit. Making cider is a good way of using up the surplus, but for most people it isn’t worth buying and storing the kit required. So what we do is get together and pool apples, equipment, bottles, labour and knowledge – a cider collective. Everyone who contributes gets a share of the spoils. We’re getting quite good at it. The whole thing is run like a well-oiled machine. But to be honest, apart from the gruelling hard labour, Cider Day is more about getting together with the neighbours for a jolly day out. The cider is a bonus. Mostly a bonus. Sometimes it’s a bit of an acquired taste. We’re still learning the art of cider making. This year we produced 20 gallons of apple juice for cider, plus fresh juice for everyone (fresh apple juice is delicious – darker and murkier than anything from the supermarket, but absolutely delicious). We’ve adopted a scientific approach this time. The cider has been split into four batches, each of a slightly different recipe and strength. These range from simple scrumpy (OG 1050) to the sinister and potentially lethal ‘Nick’s Brew’ (OG 1080, plus crab apples for an extra tannin bite). We’ll see how each brew turns out, and hopefully replicate the good ones in years to come.